Posted Aug 31, 2018 by Eds. 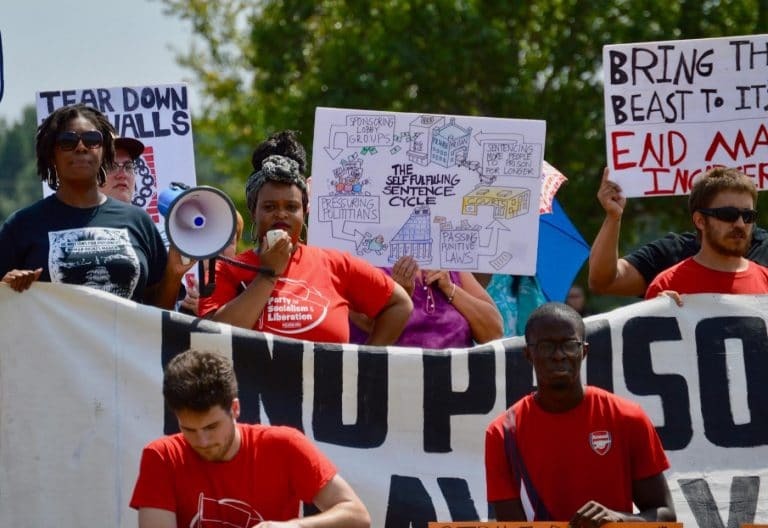 On August 21, prisoners in at least 17 States across the U.S. began a mass strike, which is scheduled to continue until September 9. 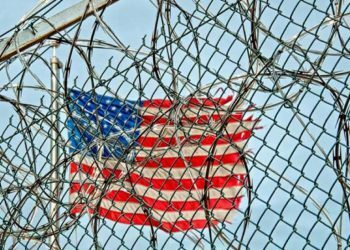 With 2.3 million people in jail–the highest number in any country–the U.S. has a quarter of all the imprisoned people in the world while having only 5% of the world’s total population. The inmates are protesting against poor living conditions, the use of prisoners as slave labour by private industries and for arms production for the military, for firefighting and other services. In return for this, they are paid a few cents a day, and in the case of Arkansas, Georgia and Texas, nothing at all. There are over 800,000 such prisoners whose labour is extracted daily for next to no pay, generating billions of dollars in profits for numerous well-known companies each year. This practice not only subjects the incarcerated–who are not protected by the labour laws–to extreme forms of exploitation but also has the effect of reducing the wages of the regular workforce. 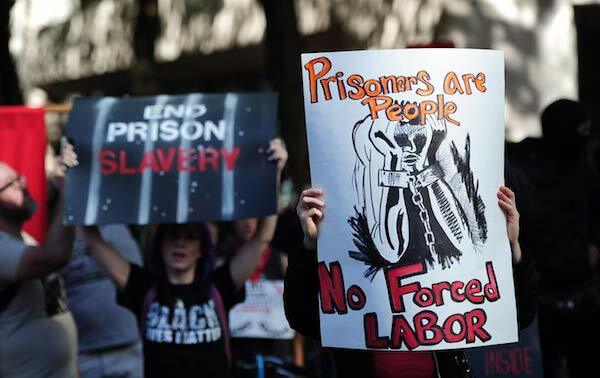 In a protest against the use of prisoners as slaves–the constitutional provision for which was made by the 13th Amendment, ratified after the end of the civil war, which prohibits slavery except when one is forced into it “as a punishment for crime”–inmates are refusing to do the work they are assigned, thus striking at the $2 billion prison labour industry. “Some prisoners don’t have the privilege of having a job; so they will participate through a sit-in, which would just be prisoners coming together and sitting in a common area, refusing to move, doing so peacefully,” said Amani Sawari, from Jailhouse Lawyers Speak–an anonymous collective providing legal services and advices to inmates, which is spearheading the current strike, with the support of Incarcerated Workers Organizing Committee (IWOC)–a part of the militant trade union, Industrial Workers of the World (IWW). August 21 marks the 47th death anniversary of George Jackson, an associate of the Black Panther Party and a co-founder of a Black-liberation group called Black Guerilla Family, who was shot dead while making an escape attempt from prison. September 9 is the anniversary of the Attica uprising of 1971. Apart from hunger strikes, the current action will also include boycotting prison services for which prisoners are charged exorbitant rates by a handful of private players who have a monopoly. An example is the prison phone system. The contract for this is awarded to private players on the basis of which of them offers to pay the highest commission to the correction department running the prisons. The rates charged for phone calls are so high that families are often forced to choose between making calls to their loved ones in prison and attending to their medical needs. For many families, the cost of making these phone calls to stay in touch their with imprisoned relatives is higher than their house rent–which is usually the largest monthly household expenditure. In Florida, for instance, a four-minute call made to an inmate held in prisons cost $56 in 2014. The following year, when U.S. Federal Communications Commission (FCC) imposed an upper limit on the price that could be charged, the five companies which have monopolized the prison-phone system used by inmates challenged the FCC decision before an appeals court in Washington D.C. After the Trump administration came to power, the FCC declined to defend its own decision, and the court ruled against price capping. A part of the costs so extorted from the families of the inmates is channelled back into the prison system in form of commissions, which in turn are used to run the prison. Thus functions a system where the families of the prisoners are paying to run the very prisons in which their loved ones are incarcerated. Families of the prisoners on strike, who are boycotting the prison phone system in protest–and thus inflicting losses on this multi-million dollar prison-phone business–are being informed by IWOC or JLS members to not place calls until the strike is called off. The set of ten demands listed by the JLS also includes revoking of the Prison Litigation Reform Act in order to allow “imprisoned humans a proper channel to address grievances and violations of their rights”, and the Truth in Sentencing Act and Sentencing Reform Act “so that imprisoned humans have a possibility of rehabilitation and parole”. With a disproportionate concentration of black and brown people in U.S. prisons, the demands also called for an end to racial practices such as denying Black people parole on the sole ground that “the victim of the crime was white, which is a particular problem in southern States.” Also called for is an “immediate end to the racist gang enhancement laws” which have led to the imprisonment of numerous people on the charge that they are members of a gang–a charge which the police often determine by race, clothing and the neighbourhood of the suspect. The strike was originally scheduled for next year but the decision was made to advance it after a seven-hour-long prison riot in South Carolina left seven prisoners stabbed to death and 22 hospitalized in April. While the prison officials blamed the violence on a gang war for control over territory and contraband cell phones, it was these very officials who had placed rival gangs in the same dorm room. Video footage leaked by prisoners using these very contraband phones, over which officials claim the riot was, showed that many injured prisoners were left bleeding on the floor for hours before the police came to take them to hospital. As history professor and author of “Blood in the Water: The Attica Prison Uprising of 1971 and its Legacy”, Heather Ann Thompson, pointed out, the fact that a tenth of the incarcerated in this prison were serving a life sentence and those serving sentences over 20 years were obliged to complete at least 85% of the time regardless of their behaviour inside–coupled with the filthy conditions and the food and water they get–creates a hopeless situation which leaves little incentive for the imprisoned to reform themselves. This provokes them instead to fight amongst themselves for phones and cigarettes, access to which is severely restricted. Soon after the decision to go on a strike was made, prison officials began trying to prevent the inmates from organizing. Those suspected of playing a lead role in organizing strikes were isolated in order to prevent flow of information within the prison. Access of prisoners to phones and mails is also reportedly being restricted. How are the prisoners organizing? The IWOC and allied organizations have been determinedly mobilizing to overcome these restrictions. Those members of the IWOC who are currently out of prison have been using the prison phone system, as well as contraband cell phones to get information from one inmate in the prison, and communicate it through a different phone call to another inmate in a different cell. Information about the strike was spread by word of mouth by informed prisoners who were transferred to different locations. Further, a number of newspapers–such as The Kite, San Francisco Bay and Solid Black Fist–which carried articles by the organizers of the strike, have been in circulation among prisoners, often under the radar. An edition of one such newspaper called the Fire Inside–was found in possession of Siddique Abdullah Hasan, a prisoner in Ohio on a death row. He was convicted on the charge of being complicit in the death of a corrections officer during the 1993 Lucasville Uprising, which was triggered by Muslim prisoners protesting against a planned tuberculosis test which involved injecting phenol, a form of alcohol, into the subject’s body. When their demand for alternate methods was rejected, the protest blew up into an uprising, and the strikers submitted a list of demands addressing numerous forms of abuses the prisoners were facing. Having found a copy of Fire Inside in Hassan’s intercepted mail, officials monitored his calls, and learnt that he was an organizer of Free Ohio Movement–a Human rights collective “concerned about the judicial and prison system in the state”. Authorities learnt that he intended to “speak to a group of people, including a radio personality, on Saturday, July 28” regarding the prison strike. Any violation of any published institutional rules, regulations or procedures. According to Hassan’s lawyers, the prison authorities isolated him from communicating with fellow inmates or outside visitors by barricading him inside his cell on July 27 with sandbags. One such approved outside visitor, who had provided him with the copy of Fire Inside, told Shadow Proof that the reason for barricading him instead of shifting him into an isolation ward might be that previously, under isolation, Hassan had managed to communicate through air vents to other prisoners, who then passed along his messages further. This is only one example of the numerous measures that the prison guards have been taking to ensure that the strike cannot be carried through as planned. However, a number of other newsletters communicating about the planned strike have managed to circulate in prisons, informing the inmates in articles printed under innocent headlines such as “It’s Winter!”, Mother Jones reported. Anticipating potential crackdowns on prisoners once the strikes began, the IWOC also provided them affidavit forms through which violations of prisoners’ rights could be reported. On August 21, the first day of the strike, 200 detainees held in the city of Tacoma in Washington State by Immigration and Customs Enforcement joined the nation-wide strike by going on a hunger strike and refusing to work. Demonstrations were held by civilians across the State, and one group marched through the University of Washington’s Seattle campus in protest against the university’s contract with Correctional Industries, which uses prison labour to build furnitures for the housing facilities and classrooms in the university. Among the several other demonstrations held across the U.S. that day included an Awareness March in Oakland–the largest city in California–and a noise demonstration outside a youth jail in the city of Minneapolis in Minnesota State. Different kinds of solidarity actions were seen in at least 21 cities, including in Leipzig in Germany. Palestinians held as political prisoners by Israeli occupation backed by the U.S., also expressed solidarity with the U.S. prisoners on strike. Late that night, when a group of protesters held a demonstration outside the Metropolitan Detention Centre in Brooklyn, New York, the prisoners inside appeared to be flashing their phone lights at the protesters expressing solidarity from outside the prison walls. The organizers outside the prison, helping the inmates coordinate and communicate with the outside world and among themselves, have heard from their contacts in prisons that strike action had started the very first day in Halifax, Nova Scotia, North Carolina, South Carolina, Georgia, Florida Northwest Detention Center in Tacoma, Washington and Folsom Prison in California. Not many reports are available about the details and the scale of the strike inside prisons. “We want to note that although there aren’t widespread reports of actions coming out of prisons..people need to understand that the tactics being used in this strike are not always visible. Prisoners are boycotting commissaries, they are engaging in hunger strikes which can take days for the state to acknowledge, and they will be engaging in sit-ins and work strikes which are not always reported to the outside. As we saw in 2016, the Departments of Corrections are not reliable sources of information for these actions and will deny them and seek to repress those who are engaged in them,” the IWOC organizers said in a press statement on August 22. The pressure that is likely to be exerted on prison authorities to use any means to crack down on work stoppages can be fathomed from understanding the deep entrenchment of an entire spectrum of financial interests in the use of prison labour. The children-friendly McDonalds, for example, is one of the corporations which rely on prison labour, by contracting Oregon Inmates to supply its staff with uniforms, which are produced by inmates. Many of the plastic utensils provided to the customers are also manufactured by firms that use prisoners’ labour. Wendy’s is another such fast food chain. But McDonalds and Wendy’s are only two household names in the vast network of firms reliant on prison labour–either by directly using prison labour for production or provision of service, or by buying inputs and other essentials involved in delivering their final product from firms using prisoners for production. More significant and less easily identifiable, however, are the huge investment firms, which invest directly or indirectly in the firms using inmates’ labour, as well as in private corporations which run prisons for profit, and which have successfully lobbied governments to pass laws which mandate prison terms for non-violent crimes–one of the vital reasons explaining why a country with only 5% of the world’s population has in its prison a quarter of all those imprisoned across the world. The companies profiting from direct or indirect use of prison labour, include banks, such as American Express Company, Bank of America, J.P Morgan and Company; energy producers such as BP America, Chevron Corporation, ExxonMobil Corporation; insurance companies such as Fortis health; pharmaceutical giants such as GlaxoSmithKline, Merck and Bayer Corporation (which has recently acquired Monsanto); telecommunication industries such as AT&T; The Boeing Company, United Airlines, Walmart, etc. Further, the Department of Defense is one of the biggest beneficiaries of prison labour, which has been used increasingly since the Second World War in the production of weapons and other military accessories for U.S. soldiers. In the face of all the repressive measures that will be used against the prisoners to prevent work stoppage, if the current strike does snowball into the largest prison strike in U.S. history and holds out till September 9, it has the potential to strike at the very heart of the prison-industrial complex, at a time when industrial and financial interests are ever more reliant on the labour of incarcerated people to reap profits. Apart from the agenda of raising political consciousness, the JLS has mentioned that their other agenda is to raise consciousness about the system amongst the prisoners–to deter them from engaging in gang-wars within the prison walls and to unite them in a common fight against the exploitative prison system in the U.S.